Probably not a combo of topics you see grouped together very often. 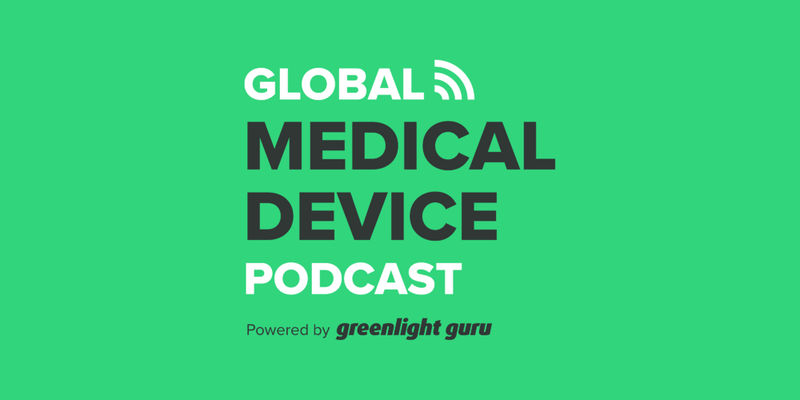 But we have them all for you on today’s Global Medical Device Podcast. This is the 2nd edition in our series focused on Design Controls and related topics within the Medical Device Industry. During this episode, we’ll surface some interesting and potentially controversial views on the subject with our three industry thought leaders. If you’re like many, you may very well have already heard about the high profile superbug outbreak connected to reprocessing. You may also have already seen some of the industry’s reactions with lawsuits being filed, FDA alerts being issued...and even the White House getting involved. That’s where we kickoff today’s conversation with our amazing guests Mike Drues, Jon Speer and Jason McKibbin along with moderator Bill Loss. You’re going to want to listen closely because these guys really dive deep on some important and controversial topics. 1. What’s the background behind this reprocessing tragedy anyway? 2. How do our experts see the responsibility panning out at the manufacture’s level as well as those ultimately handling the reprocessing? 3. Could better orchestrated design controls have potentially prevented this tragedy? 4. Do existing design controls apply to problems like this, and if they don’t, should they? 5. Was this problem a design control failure or possibly different steps that should have been handled during the design review process? 6. How do you feel the Design Verification and Design Validation process should fall into place? 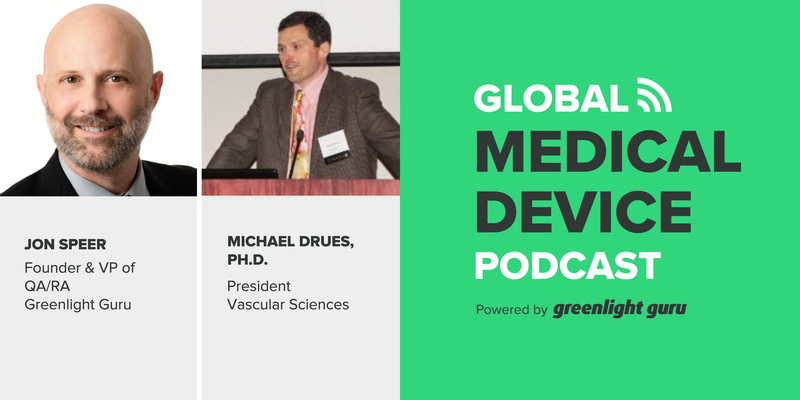 Michael Drues, Ph.D., is a prolific speaker and consultant to the medical device industry as well as being the President of Vascular Sciences. Jon Speer is co-founder and resident “Guru” at Greenlight Guru, making waves with his innovative approach to QMS software being built exclusively for the medical device community. Jason McKibbin’s medtech experiences spans more than 15+ years and in his more recent past played an integral role as COO of MEDISISS which was acquired by Medline Inc. Jason’s currently COO at Greenlight Guru. Bill Loss has spent the last 20 years in the startup world and actively invests and advises in the medtech space. Bill: Hello, and welcome to today's podcast, "Should design controls have prevented the recent reprocessing tragedy: Do we need new regulation?" It's the second in a series focused on design controls and related topics within the medical device industry. During today's podcast, we'll serve you some interesting and potentially controversial views on the subject. My name is Bill Loss, I've spent the last 20 years in the startup world and actively invest and advise in the medtech space. Thanks for listening in, really excited to kick off today's podcast. We're joined by three industry veterans. First up, we've got Mike Drues, president of Vascular Sciences. Mike is an internationally recognized expert and featured keynote speaker on cutting-edge medical technologies and regulatory affairs. We're also joined by Jon Speer. Jon is co-founder and resident guru at greenlight.guru, making waves with his visionary approach to delivering an eQMS solution built exclusively for the medical device community. And last, but certainly not least, we have Jason McKibbin. Jason's experience spans more than 15-plus years in the medtech field and in his more recent path, played an integral role as COO of MEDISISS, which was acquired by Medline Industries. Jason's current gig is that of chief operating officer at greenlight.guru. Gentlemen, thanks for spending some time with us today. Mike: Thanks, Bill. It's a pleasure being with you today. Bill: You guys doing good? Jon: I'm good here. Thanks, Bill. Bill: Alright. We're gonna cover a lot of ground in a very short period of time so let's get at it. For those of you listening in, you may very well have already heard about the high-profile superbug outbreak connected to reprocessing as first reported at UCLA's Ronald Reagan Medical Center a couple months back. The industry's already seen lawsuits filed, FDA alerts being issued with follow-on guidance, and now, even the White House getting involved with a five-year road map to combat antibiotic-resistant bacteria. Hey, Mike, let's start the discussion off. What's the background behind this reprocessing tragedy anyway? Mike: So as you just started to describe, Bill, over the last few months, there's been an increase in reports in the popular press about patients that have become infected after having certain types of endoscopic medical devices in them, in this particular case, a device called a duodenoscope, because these devices were not cleaned and reprocessed properly. And the focus of this podcast, obviously, is to get into the details of that, especially from the regulatory side and talk about why this happened and what we can do to prevent it. But long story short, it's a terrible tragedy obviously, because several hundred people have been infected and a small number of people have actually lost their lives. And of course, this is a terrible thing, but I think anybody that thinks this problem is really new, even though it's been newly reported in the news at UCLA and a few other hospitals across the country, I think anybody that thinks it's new is, quite frankly, naive. I think the reason why most people are talking about it now is because, as you alluded to, Bill, CRE has now reached the point of being a superbug, which basically means that it is antibiotic-resistant. Bill: Yeah, no, I'm just gonna say, absolutely. When we're thinking about that, and Jon and Jason, when you think about the responsibility that spans across the... Or should I say, at the manufacturer's level as well as ultimately, the folks that are handling the reprocessing. Maybe Jon, you can maybe share a little bit, how do you view that responsibility shift? And ultimately, who is responsible? Jon: Well, it's an interesting issue to think about. And Mike is right, I haven't been that product development engineer in the past, I often had the mindset early on in my career that this reprocessing thing, it's not my issue. I design single-use disposable medical devices, they're not intended to be reprocessed. However, as time has gone on, it's clear that this is a real thing, this is happening for products that are designed to be reprocessed and reused, and also for products that are not designed to be reprocessed and reused. So the med device engineer who is designing that new product absolutely have to factor in to the equation during the product development, manufacturing, and design; all those steps that the product that he or she is developing is very likely to be used multiple times and reprocessed in between. Bill: No, absolutely. And Jason, obviously coming from MEDISISS and being a registered third party medical device reprocessor of single-use devices, I'm sure you've got some pretty strong opinions. What do you have to say? Jason: Yeah, I would agree. I think that the complexity of reprocessing devices, and in particular, what we have to contextualize in this conversation is the fact that we're really looking at reprocessing as it is conducted within the health care facility, the hospital or surgery center. And that environment is completely different than what you would see in a third party reprocessor. A third party reprocessor is regulated by the FDA, they fall under all of the design controls as well as all the process controls. And I think apparently where the disconnect becomes where you're looking at devices that essentially are manufactured by an OEM, but then given to a hospital or surgery center group process, the differences is that they are done so under a much or an uncontrolled environment in respect to what you would see within a third party reprocessor. Speaker 1: S5: And it really comes down to, I think, the complexity of devices and then the complexity of steps that are required at the hospital or surgery center to perform the reprocessing of those devices. What that really falls into is a category of a hospital has a washing sink or rinsing sink or washer sterilizer, and maybe a subsequent sterilizer where they're behind your peroxide or ethylene oxide or steam, and these devices essentially fit into that one single process, they don't have the flexibility of being able to do 35 steps for this device, and 15 steps for this device, and six steps for this device, and 30 steps for that device. And so inherently the complication really comes down to really the design of the device and does it take into consideration the environment, which is reprocess, and how that environment reflects on the design complexity of both the cleaning and sterilization of that device. Bill: No, definitely well stated. Jon, when you think about the brief conversation which has kicked back and forth, what's your take on really, whether we need new or additional regulations to really prevent something like this from happening again? Jon: That's a great question, I suppose. I chuckle a bit because that reminds me of a few conversations that I've had with Mike about regulations. I guess in a word, do we need new regulations? In a word, no. We have plenty of regulations to dictate the design, development, manufacturing of medical devices. I think the twist is, we need to follow the regulations that are already in place. The point that Jason made is that there are plenty of regulations, guidance, documents, and stipulations that are placed on the medical device OEMs and medical device reprocessing companies. The twist here is the hospitals and the point of use facility that are doing the reprocessing, if they would follow the regulations that exists for design controls, if they follow the criteria that FDA has already stipulated for reprocessing products then perhaps we wouldn't have this issue that we're hearing about today. Bill: No, that's definitely fair. And I guess Mike's thinking about the broader medical device manufacturing as a whole. How do you think maybe doing a better job of implementing best practices could have actually avoided these chain of events? Mike: Well, let me come to that in just a moment, Bill. I'd like to come back and add very briefly to what Jason and Jon just talked about. Mike: First of all, with regard to Jason's comments about the difference between a reprocessing company versus a hospital, I think that's one of the root causes of this problem because when you think about it, medical device reprocessing has been going on since essentially, the beginning of medicine. This is nothing new, but the reprocessing was being done by hospitals and one could easily argue that the reprocessing of medical devices in a hospital like pharmaceutical compounding is the practice of medicine, something that is beyond the bailiwick of FDA oversight and as a matter of fact, in the interest of full disclosure, I was one of several people that were invited to present at the FDA panel meeting a few weeks ago, and this is one of the most important topics of discussion. Mike: There were several panel members that specifically asked the FDA if we recommended to you that you needed to regulate the reprocessing of devices in hospitals. Is this something that you could even do? So again, without a change in the regulation by Congress, that's not something that FDA can just simply do on their own. That's number one. Number two, with regard to new regulation. Well, I would say yes and no. For better or for worse, we already have new regulation. There was a new guidance that just was finalized in March on reprocessing that basically now requires for all medical devices across the board: 510Ks, PMA, and so on for any medical device that is labeled to be reused, there needs to be a validated reprocessing protocol in there. Mike: One of the questions that I raised at the panel meeting though was, does it make sense for a medical device manufacturer to develop and validate a cleaning procedure if they, in fact, are not the ones that are doing the cleaning? I think there's a huge opportunity for medical device companies to actually work with the folks in the hospital that are actually doing this cleaning. And let me tell you, coming out with a hundred page plus cleaning procedure, as some companies have now done, is not a solution to this problem. Coming up with a new brush to clean these certain kinds of medical devices, in my opinion, is not a solution to this problem. We need more people working together. Specifically, with regard to existing regulation, I agree 100% with Jon, we already have it. In the design controls, one of the basic philosophies of the design controls is to design your device to meet the needs of the user. Mike: Well, in the context of design controls most of the time the user is the physician, but if your device is labeled to be reused, one of the users is the reprocessor and so we should be designing our devices with the reprocessor in mind. This is a phrase I coined a number of years ago I called design for reprocessability. So we should be thinking about how we can design our devices to be reprocessed in a more effective way. And the last example that I wanna mention is usability testing. Once again, because of the infusion pump disaster of a few years ago, that led to usability testing requirements across the board. When we talk about usability, most people's connotation of the user is the physician, the surgeon, whoever it is that's using the device on the patient clinically. But if our device is being labeled to be reused and reprocessed, again, our user is at least in part the reprocessor as well. Mike: So bottom line, we already have existing regulation that should cover this if we try to understand not just the letter of the regulation, but the intent of the regulation and with this new guidance that coincidentally was finalized literally days after the UCLA tragedy was announced, of course, that's pure incidence and I hope your audience appreciates my not so subtle use of humor there because Health Canada finalized a similar guidance five years ago. So, why is it taking us so long? But we have both new regulation and existing regulation. If we use it properly, that can solve these kinds of problems. Bill: No, that's definitely well stated. You brought a phrase that's very prominent in the medical device field, which is design controls into your description there. Jason, kicking over to you based on the volume of experience you've had in this area, how could better orchestrated design controls have potentially prevented this tragedy? If we focus on design controls, what's your thoughts around that? Jason: I think as Mike touched on it. I think it really comes down to really understanding the user needs and the implication to all the parties involved. You're not just building a device for a physician, you're actually building a device for a health care facility. In that facility, there are multiple touch points and those touch points do include things like cleaning, performance, packaging, sterilization, and how do you make sure that your device is designed in a way that adapts to the environment in which it's going to be integrated into and that it ensures that the device itself can be cleaned, sterilized, recognized for performance and done so in a safe and effective manner. And so really, I think the design controls are the absolute entity that really allows us to ensure that we take into consideration all the different elements that we need to do when designing a device and therefore, making sure that we include all the parties and that will help OEMs to design and develop devices that are easier for health care facilities to reprocess. Jon: Sorry, let me jump in here but I'm gonna... These are fascinating points. And I think Mike has mentioned the statement about having some sort of protocol that the OEM provides to a hospital or a point-of-use facility to clean and reprocess. That's an interesting concept. And at the same time, my experience tells me almost every single hospital seems to be unique in their infrastructure and their ability to clean and reprocess. So, trying to develop a protocol that could be standardized, it's a huge opportunity or issue to address and I'd like to believe design control could be a way to help with that, but at the same time, it just seems like it could be overwhelming for a medical device company to consider every single possibility, every single scenario, every single cleaning method or reprocessing technique that can be used in a hospital. I'm baffled a bit about how design control is going to fix that. Bill: Yeah. If you look at it, it's a barrier and there are so many external variables which leads us into wrapping up today's podcast here, podcast with what I guess I would define is maybe a bit of a sore spot at least something I know you Jon see as a pet peeve and a primary reason for actually co-founding greenlight.guru. The subject of risk comes up often usually in the context of many medical device companies not placing enough emphasis on identifying potential risks or hazards early enough in the research and the design phase. Jon, just wrapping things up here, why don't you start off by sharing some final thoughts on this thread for us? Jon: It's certainly and definitely a risk management issue. Mike mentioned it earlier, if the medical device engineer who's designing the product is ignoring reprocessing, that's failure of a risk management process from the beginning. It's clear, I go back to my days again working with a single-use medical device company and a lot of catheter-based technologies. It's like we tried to ignore it out of site, out of mind. We knew reprocessing was happening but we never factored that in to our design control process. We never factored that in to our risk management process. And that is a huge, huge mistake. As Jason and Mike have both mentioned, you've gotta consider the user needs and you gotta consider the intended use of your product and also the unintended use or misuse of your product or all the ways that your product can fail. And that's where risk management really comes in and it's just risk and design control, risk management are exactly one and the same process. If you read through 14971, the Risk Management Standard, and you read through FDA Design Control Regulations, if you can't draw a conclusion that these things are one and the same, then you need to revise your process completely. Bill: Oh, yeah. And you guys obviously are the experts, but when you think about even the FDA's water flow diagram it's starting to pull in design verification and design validation into the entire process, it is a continued... It's not an event, it's a continued process. Before we conclude today, Jason I'd like to hear your final thoughts, and then Mike we can get you to chime in here before we end. Jason: Yeah. I think that Mike and Jon have both made very relevant comments and appropriate to the situation. It's extremely complex. 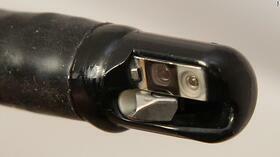 On one side, you have no end of designing a device that is intended to be reprocessed within health care facilities. However, the end process of actually conducting those reprocessing steps are embedded into an environment that are greatly different from one to another. And therefore, I think the ultimate solution, and I think the idea of having regulations are not. I think to Mike's point, the answer is yes and no, and a lot of it has to happen with the two industries being able to work together to come to an amiable solution, that at the end of the day allows for the integration of these processes. Jason: 'Cause if you think about a third party reprocessor, one of the things that they do and they control is, now it's just a design and develop all the processes that reprocess the device, but they also provide all the contracts and validation to ensure that it's done appropriately and safely. And then from a manufacturing standpoint, they have all of the infrastructure in place to ensure that they can repeatably reprocess those devices safely and effectively. In a hospital environment or a surgery center environment that is very different, they're not under the same office or regulations to conduct themselves in the same manner to ensure that the adaptability of the cleaning and reprocessing instructions do in fact actually fit their environment or what can they do to ensure that their environment can fit those devices. Bill: Hey, Mike, any final thoughts? Mike: Yeah. Thanks, Bill. So I agree with much of what Jon and Jason have talked about. I'd just like to leave the audience with a few final things to think about. There's solutions to all of these problems. As I alluded to earlier, these problems are not new. These problems are not unanticipated. Some of us have been talking about these things for several decades. Some of these problems could be mitigated best from better technological solutions. I don't wanna turn this into an engineering or a technology discussion, but simply put, there are a lot of things that we could build into endoscopes that would minimize, if not totally eliminate, the likelihood of cross-contamination. Other problems can be achieved by a regulatory solution, whether it's existing regulation or new regulation. But the solution to most problems, in my opinion, is more communication, not less. And what we really need is we need the medical device manufacturers, and in this case, the hospitals who are doing the reprocessing, communicating with one another. And one thing I've learned in my 20 plus years of playing this game, is just because two people or two organizations are talking does not necessarily mean they're communicating. Mike: So we need more communication going on. We need to understand how these things happen in the real world, not in the theoretical world of regulatory affairs, but in the real world of the practice of medicine. And the last thing I would like to leave your audience with is, maybe I'm naive, and certainly many people think so, but the question is, Do we need anybody? Do we need regulation? Do we need FDA? Do we need the government telling us to do things that we all as engineers know we should be doing anyway? Most of what's in the design controls is really no more than what I call prudent engineering, something that all of us are supposed to be learning in engineering school. Because at the end of the day, these products are being used on family members, on friends, perhaps someday even on one of ourselves. And at that point, when that happens, I really hope that somebody did their job and I don't just mean following the regulation. I mean, did we do what we should do? We have a responsibility to our customers, to our patients. I understand medicine is a business but there's a lot more to it than just that. Bill: Well, guys, very insightful. Thanks so much for spending time with us. Your thought leadership in the community is very much welcomed and appreciated. And to those of you listening, thanks for your continued feedback and shared enthusiasm. If you like to stay in touch with Mike, you can check out more of what he has to say on his guest column at Medical Device Online magazine or connect with him on LinkedIn. You can check out more of Jon's writings, as well as Jason's at www.greenlight.guru/blog or ping either of these guys on LinkedIn. Till next time, let's continue working together towards improving the quality of medical devices in the market and the quality of life for the people we collectively serve.